Hire Reliable and Cheap House Removalists in Perth? Why is it Essential To Hire Reliable and Cheap House Removalists in Perth? Moving your house to a new location is a stressful affair that comprises of many tough challenges. It could be nerve-wracking for you right from searching the perfect property, getting a great deal, completing the paperwork, signing an agreement, and to finally getting down to packing, loading, relocating, unpacking, and settling in your new home. Therefore, it is essential for you to go for hiring one of the reliable and cheap house removalists in Perth that can help you perfectly plan and execute timely, efficient, and safe removal of your households at a reasonable price. 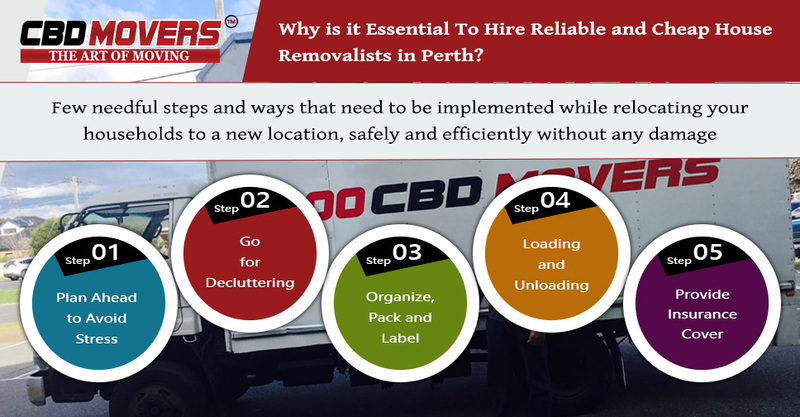 At CBD Movers, we are renowned as one of the reliable and cheap house movers in Perth that ensures the best customers’ experience throughout their move. Our experienced cheap house movers in Perth are committed to delivering high-quality commercial and house movers services at the cheap and budget-friendly and prices. Plan Ahead to Avoid Stress: The best way to counter with the stress of cheap house relocation is to accept this challenge and plan ahead. Suitable and meticulous planning can help you counter your stress and also organize your move better in the best possible way. Go for Decluttering: To make sure your house relocation an effective and cost-friendly move better discard the things that are no longer required. You can rid of your excessive stuff either by donating it to some charitable societies or going for a garage sale. This will help you save on effort and cost of packing and unpacking unwanted things and in turn, even cut down on the corresponding moving cost. Organize, Pack and Label: Pack items in suitable quality boxes or cartons according to respective room type or number. Don’t forget to pack the things separately in a box that will be required immediately upon reaching your new home. Finally, label all the packed boxes, clearly mentioned with the list of items to ease your unpacking chores and reduce stress significantly. Loading and Unloading: Loading and unloading of items are not just about picking and placing things. You need to be competent and skillful in loading to avoid any serious damage to the materials during the move. Make a practice to place big and robust boxes at the base and don’t hesitate to use proper loading and unloading gear to undertake the task. Strap your box packing properly to hold them in place. Provide Insurance Cover: It would be never easy for you to replenish and restore the loss of your prized possessions without comprehensive insurance coverage. Having a reliable insurance cover to your belongings will give you total peace of mind during your move with a feeling of a safe and financially protected house removal. Get a Competitive Deal Price: Before finalizing the ideal House removalists Perth, it is essential for you to negotiate and compare quotes from all leading Cheap removalists Perth. Try to get an all-inclusive quote considering the desired removals services. Finally, go for hiring one of experienced and professional and cheap House movers in Perth who offer you superior service quality at the best competitive rates. It is worth considering the above steps to organize and manage your move efficiently without making a big hole in your pocket. If you are looking for established and cheap house removalists in Perth then CBD Movers is a name to reckon in the arena. Previous PostPrevious Is It Really Worth Getting The Professional Support of Furniture Removalists in Melbourne?